If your lawn is flooding, suffocated on thatch, newly constructed, or your grass gets a lot of foot traffic, lawn aeration can help keep your lawn looking beautiful and improve the water flow in your topsoil. Grass is a living thing, and as such it sheds waste and grows just like any other plant. As root systems get denser and shed grass builds up, known as thatch, it may combine with soil compaction— this becomes harder and harder for water, nutrients, and even air to feed your grass. There’s a lawn care solution for this: aeration. This blog compares it to other options and explains why core aeration is the best lawn aeration option. 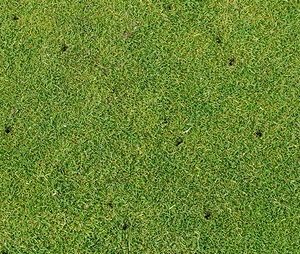 Core aeration – also known as plug aeration – uses a machine with hollow spikes or tines to punch into the earth and mechanically remove these cores or plugs of soil, roots, and thatch from the ground. This leaves hundreds of holes down to the soil layer to combat soil compaction and allow water, nutrients, and air to flow back into the soil and grass. By aerating the lawn this way, you remove the “root” cause of the issue and allow the grass to regrow for another season. The other common type of aeration is spike aeration. This type of machine uses solid tines that stab into the sod and soil, but instead of pulling out plugs of soil they instead simply push the thatch, roots, and soil aside. While easier to do and therefore cheaper, spike aeration tends to be more short-term as no real breathing room has been made for your grass and soil. Soon those gaps that were created will be pushed back out, and you’ll be back to square one. There are three major issues that lawn aeration can help solve when it comes to lawn care. Make sure to get a consultation from a lawn care specialist to make sure your problem can be solved by lawn aeration. Poor Drainage or Swampy Grass: If your grass is forming large puddles during rain or watering, or if patches of moss are starting to form on your lawn, you may need aeration to help drain it. High Soil Compaction: If your home is newly constructed, you’ve got a fresh sod installation, or your grass is subject to high foot traffic, lawn aeration can help avoid the problems of rock-hard soil. This depends on the type of grass you have. If your grass is a warm-season grass, you’ll want to do it in mid-spring to early summer during the beginning of its grow period. If you have a cool-season grass, you should aim for early fall. This, combined with lawn fertilization and other lawn care services, can help your lawn thrive. If you’re interested in lawn care services, including aeration, fertilization, seeding & overseeding, and seasonal service packages, contact Greener Horizon, and we’ll be there.